Content Management Systems(CMS) are setup up to contain a number of menu items that are used to categorise web pages and to provide the structure in which users will navigate the website. 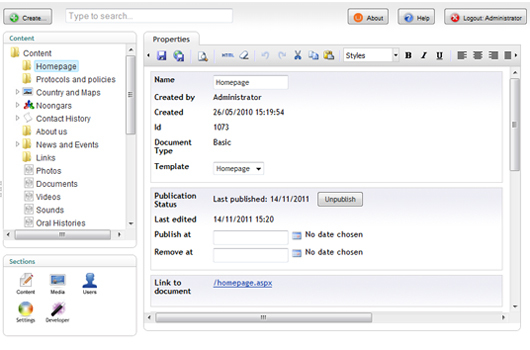 Website Content Managers (WCM) are able to edit the menu items and their underlying web pages. WCMs are also able to set up web pages that link to content (in the form of text and files) managed within their Cultural Database (CD). Web pages are setup to correspond to specific forms defined within the CD. For example the website/CMS may include a menu item called “Videos” which corresponds to the “Videos” form setup within the CD. These web pages would then extract and render publically shared video material directly from the CD. The CD typically contains a User Group called “Public” that is used for sharing content to visitors to the website. This User Group is marked as “needing approval“. This means an administrator of the CD needs to authorise specific content before it is published.